Being a mum is tough work. You’ve got the kids to keep in order (not to mention that mischievous man of yours), you can spend hours at a time in the kitchen, and you still like to look good at the end of the day! The solution? 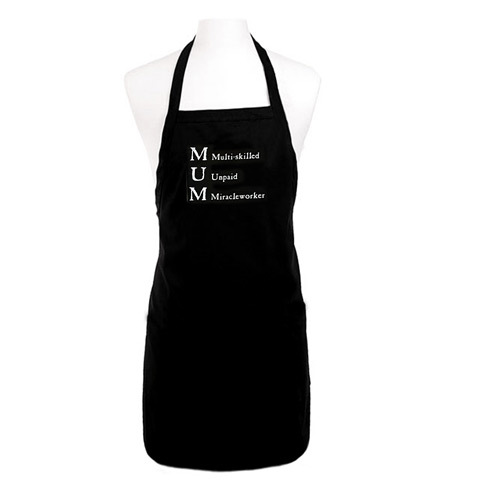 The Mum Apron from Annabel Trends. This funky apron is the perfect way to tell the world that you’re Multi-skilled, Unpaid and a Miracle worker – it’s printed with these words, which spell “Mum” in an acrostic. After all, there’s no better way to get the message across than with an acrostic! (Seriously, no better way. If you can think of one, you tell me). Best of all, it’s designed to stand up to any stray spills and splatters in the kitchen. Barbecuing, baking, serving…whatever kitchen task you need to do, this apron will keep you covered. If you want to let people know just how important you are (or if you know a mum that deserves a little recognition), do it with an apron! Decorated with an acrostic of the word MUM, reading “Multi-skilled, Unpaid, Miracle worker” in white print.